No color correction. It really IS this blue. 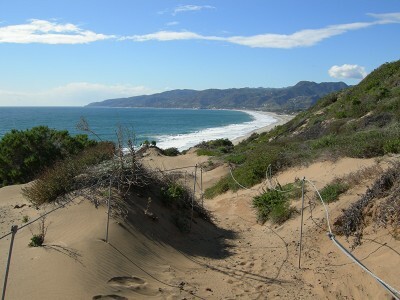 The Point Dume Headlands. A magical spot, walking distance from Paradise Cove at low tide, or a spontaneous side trip when the car has a mind of its own heading back from the post office a mile up the road. Charles and I try to break up our work afternoons during the week with a stroll amidst nature’s joy and sanity, and yesterday it was Destination: Whale Watch. My friend and fellow Cove blogeressa Veronique de Turenne had told me a couple days earlier that she witnessed 12 gorgeous cetaceans hugging the shoreline, protecting their newborns while trudging up the coast on their many-thousand mile odyssey. What a sight. Inspired, we went to the best seat in the house at the very tip of the Santa Monica Bay: Point Dume. The peninsula juts out in glee for visitors and in peril for the boats caught unawares by sharp rocks lurking just below the waterline. 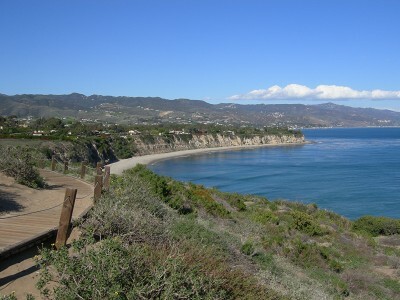 With a simple combination of a narrow boardwalk and sandy dunes, this protected land jealously shares space encroached upon by mansions lining the cliff of the Malibu Riviera. Where’d they go? Did the Union give them a lunch break and no one informed us? Are they striking, in protest of the commercial squid boats whose flood lights lure the cephalopods and deplete the whales’ food source? Or maybe they knew I had my camera poised to capture their grace, and like the Amish, didn’t want their souls stolen. Lack of exceptionally large mammals not withstanding, everything else that we did see was nothing short of stunning. How lucky, lucky, lucky, to be able to step outside and experience this. No matter how many years I’ve viewed these same expanses, never have I taken them for granted. It’s always a whale of a time. “Of Breath and Touch” could refer to the smell and texture of this plant. A tuba wafting through the air. 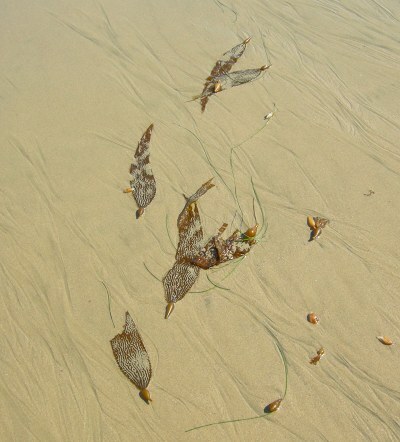 I like the illusion here of the kelp leaves parachuting through the sky in a moderate breeze, gently making their way toward Earth. I like it when things are not as they appear. And when things appear as they are not. 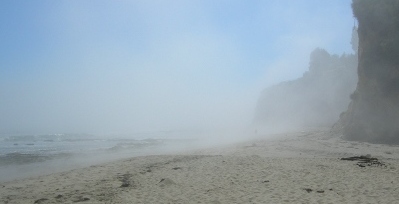 Like a powerful invader, thick fog pushed hard against our cliffs and blew through the canyon yesterday. Quite oddly, this visitor refused to leave, persisting from morning to sunset. 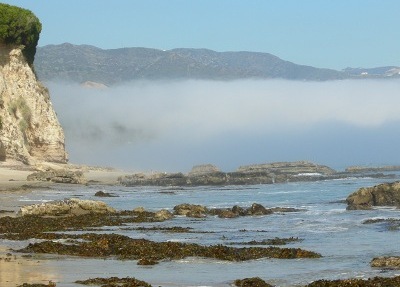 Our ocean fog banks usually burn off in the noontime sun; this day was eerily different. My afternoon beach walk became an exploration through unfamiliar territory, as a pulsing white scrim turned everything I thought I knew about Paradise Cove’s reality into a mystery. 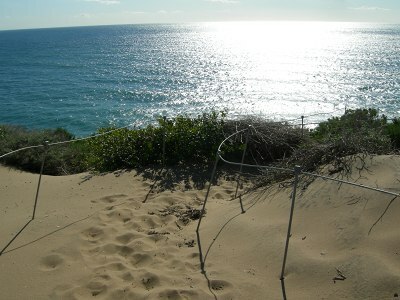 The sea had pulled out. Large oily tufts ripped from the kelp beds were strewn along the tide line, the result of the pounding surf that had lulled me to sleep the night before. The air was simultaneously warm and cool and the beautiful and lurid smell of decomposing plants rose up to meet every misty kiss. The sound of the beach seemed somewhat deadened, and in its place was the heightened visual of a world that after all these years was once again new to me. Take off your sandals, mon. Okay, I readily admit: when we do finally get up to San Juan Island (soon! ), I will most definitely miss the amazing, balmy southern California winters. No question about it. I will NOT miss the constant fire threat that accompanies our meteorological bliss, but for the moment I count my blessings that the house is still standing, and I’m basking in this heat like a lizard in the sun. 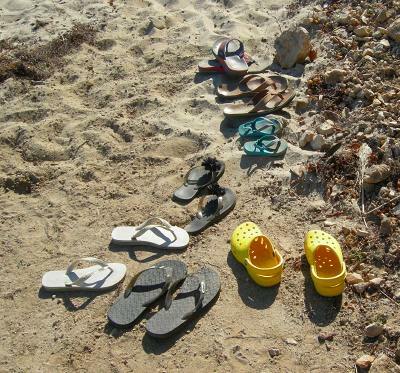 Today it was over 80 degrees here, which demanded a mid-afternoon barefoot beach walk. As you can see, we weren’t the only ones with the barefoot idea. Everyone has their own personal soundtrack. 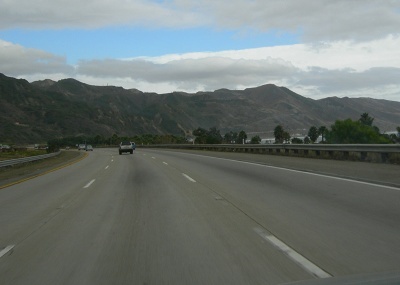 The drive up the coast to Santa Barbara, and it’s retrograde counterpoint back down, are both beautiful. This, above, is a brief moment of the counterpoint. I have a nasty habit of snapping photos through the windshield while moving at high rates of speed. So far, no run-ins with the highway patrol or, even better yet, with other vehicles. I sense that my lame excuse would not hold up well in court. The music I listen to… no, blare… on these drives back and forth runs the gamut. Lots of rock, alternative rock, alternative jazz, music from other countries, film scores, electronica, and of course some contemporary concert music. The latter is heard least often in my car even though it’s heard most often in my head and in my work as a chamber music composer. The low frequencies and subtleties of the tricky mid-range just get lost and boomy against the omnipresent road noise. Rubber tires on pavement at 72 MPH is not a delightful sound, and only certain kinds of music can hold up against it. What fascinates me most is how my random listening choices underscore what I’m viewing from behind the wheel, and how that view can be completely altered with each new track. One minute I’m lost in the midst of a meditative and inward world; the next I’m being pushed down the highway with a groove that lights up the entire scene unfolding ahead. Either mood direction usually works, although I find that when I’m stuck in traffic, I’ve got little patience for pieces that are stuck in their own tedium. When the rest of me is just stitting there, my ears need some action, dammit! Before I switched my career to such artsy-fartsy pursuits, I made a modest living composing soundtracks for film and TV projects. Now I’m happiest to let the composers and songwriters on my iPod or CDs create those road-movie scores for me, and I can just direct. After all, isn’t that what everyone in L.A. wants to do? A lullaby I wrote and made a demo of over a decade ago, based on a friend’s simple tune she sang to her infant. 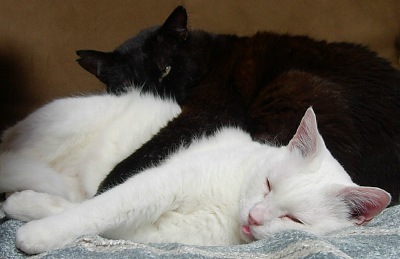 Yeah, when my tongue flops out of my mouth, I’m sacked, too. Yep, more wildlife here. Yet another bird! Remember, kids: miniature feathered dinos. The chain from the past to the present is larger than it appears in your side view mirror. 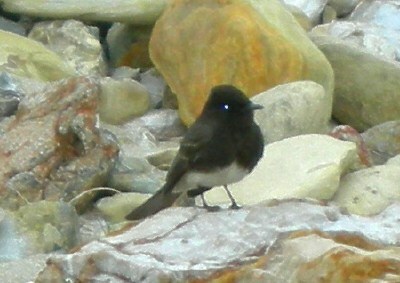 This is a Black Phoebe, one of my all-time favorites. 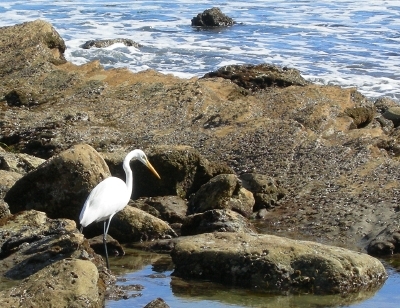 A loner, he/she (I’m not that good at this to be able to tell) hangs out on the cliff-side of the shoreline a few yards from the pounding tide, alternatively flitting about a few feet above the sand and rocks, and then coming to rest (thus, the photo. Glad he got tired). At a whopping 4″ tall, they are really, really cute. The tufted head is soft and fat, and the perfect black cape that hangs nonchalantly from his little birdie shoulders makes him the most adorable action figure on the beach. Next to me, of course. 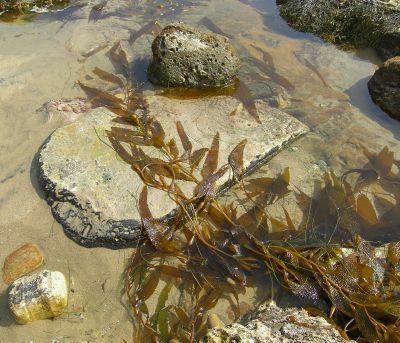 Looking for lunch at the tidepool deli.